The GCI strives to be an active member of the chemistry community. We are involved in many initiatives and outreach events aimed at promoting green chemistry principles and raising awareness about sustainable lab practices. Below are some of the major activities we are currently involved in. 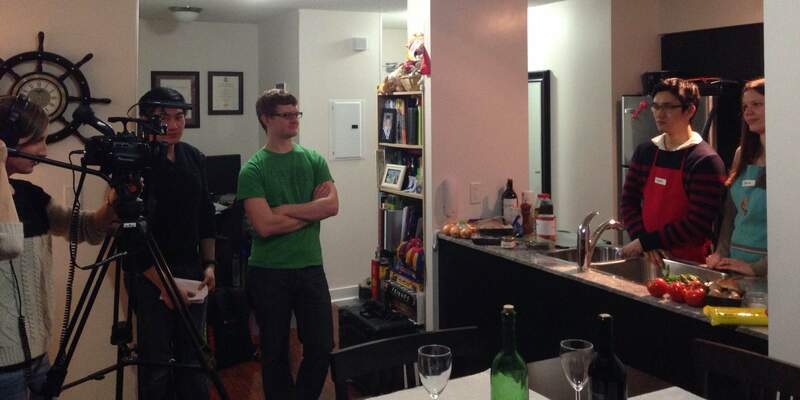 The main goal of this initiative is to regularly raise awareness about green chemistry in our graduate student community at U of T. At weekly social gatherings, the GCI provides graduate students with a green chemistry trivia question. All correct responses are entered into a monthly draw for goodies. With this initiative, we provide a fun way to educate graduate students and get them thinking about green chemistry so that they can make greener choices in their everyday research activities. As part of our public outreach activities, we participate in Science Rendezvous every year to teach kids and the general public about green chemistry. Our main activity is a hands-on assembly of a solar cell, using blackberry juice as the light-absorbing dye, which we then test to show that light energy can be converted into electricity. We also talk about the impact that green chemistry can have, given the importance of chemistry to everyone's daily lives. We always get great feedback at our booth, especially from the parents! It is important that we promote awareness about green chemistry to both chemists and to the general public. We are currently working with Let's Talk Science to design kid-friendly, interesting activities centered around the principles of green chemistry. Through these activities, we hope to break some of the common myths about chemistry and to provide a general overview of what green chemistry is and why it matters. The Green Chemistry Initiative's Waste Awareness Campaign aims to educate students, researchers, and staff about how to properly dispose of both hazardous and everyday waste materials. We aim to motivate those in our department to take the time and effort to reduce waste and to correctly dispose of the waste generated. To do this we have compiled chemical waste data from the Lash Miller Laboratories over the past eight months into a poster found below. 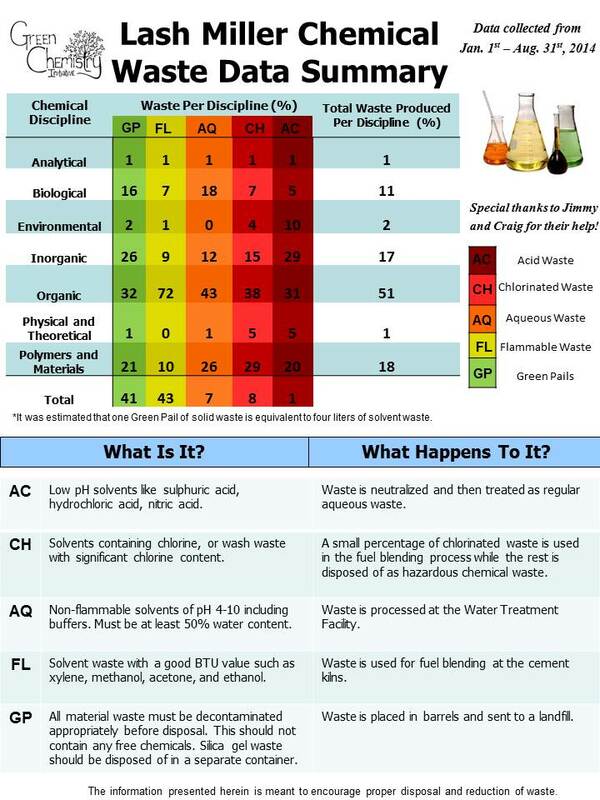 This allows students to see the contents of each discipline's waste, subdivided by waste type (Acidic, Aqueous, Chlorinated, Organics, and Solid), and readily displays the areas for improvement. The colours indicate a combination of environmental and economic considerations ranging from less hazardous to most hazardous from Green to Red, respectively. The bottom of the poster describes what chemicals should be combined in each waste category, and what happens to that type of waste once it has been collected. The next steps involve updating the table each semester to monitor the progress of our department by displaying the percent increases or reductions compared to the previous semester. This video series explains each of the 12 Principles of Green Chemistry, to serve as an introduction to green chemistry for anyone interested. In each video, we explain one principle by using analogies or examples to show the importance of that principle. We've also written a blog post to accompany each video, where we often link to additional resources. The purpose of these videos is to not only teach chemists how to make green decisions, but also to provide students, teachers, and the general public with the knowledge of what green chemistry is all about. More about this project can be found over on our blog. 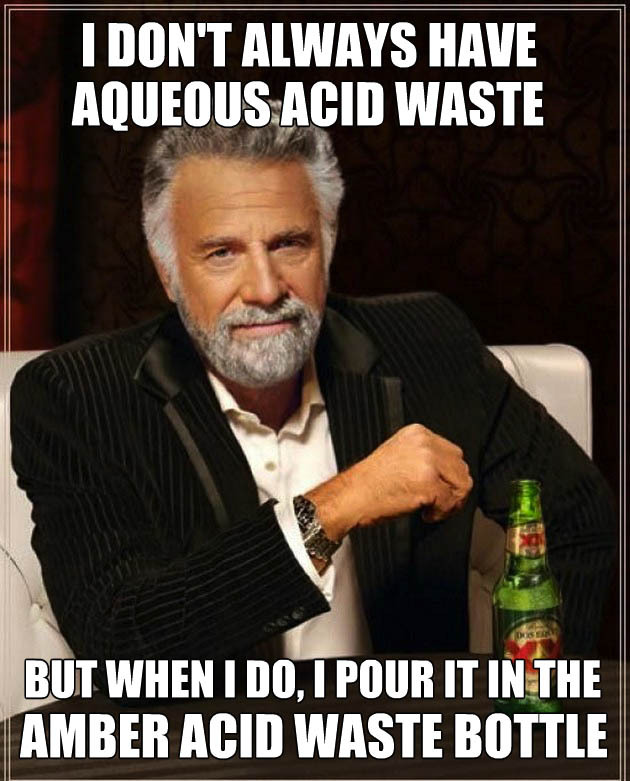 Chemical research produces lots of scientific progress, but it also results in variety of chemical waste. 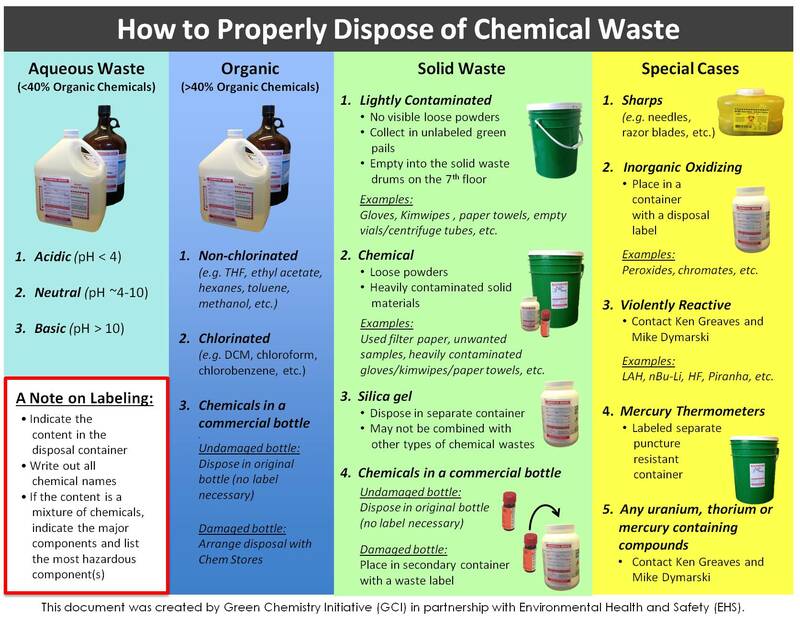 Different types of chemicals wastes need to be separately to ensure safe disposal. We developed an easy-to-follow poster to guide all researchers in the U of T chemistry department to properly segregate different types of chemical waste. 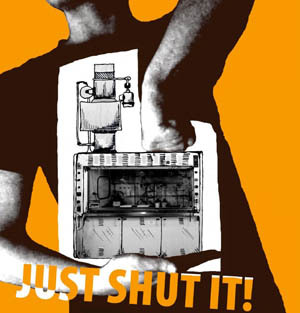 In order to save energy on a departmental scale, the GCI in collaboration with the Sustainability Office has been conducting the "Just Shut it!" fumehood campaign in the Davenport Wing. We created a friendly competition, with prizes to be won, to promote the correct usage of the variable flow fumehoods. There are two ways to comply; first if you're not at your fumehood, it should be shut below 3 inches, and second if you are working at your fumehood, its height shouldn't exceed 14 inches. We have been monitoring the height of the fumehoods through a data acquisition system to compile and quantify the actual energy we saved during the campaign. We hope the organic, bioorganic and inorganic students enjoyed the challenge and will continue to 'Just shut it'. Stay tuned for the continuation of this campaign in the new year! The Drain Campaign aims to keep chemicals away from the drain in undergraduate labs. For many first year students, working with chemicals is a new and exciting experience but it can also be stressful and make students forget simple chemistry practices when cleaning up. Instead of chemicals being sorting into specialized containers, they are poured down the drain which is not only illegal but extremely harmful to the environment. To help combat this very serious issue, we have produced stickers to put around the undergraduate labs to educate and remind students to take a few extra seconds to sort their chemicals properly. We have also created eye-catching, funny, meme-based posters to hang in the undergraduate lab hallways where students wait to enter their classes. Hopefully, both of these approaches combined will help to reduce the amount of improper chemical disposal in first year undergraduate labs. The initiative's next step is attempting to get these small but important reminders in the undergraduate lab manuals to keep spreading this important message. There are many well-designed chemistry courses at U of T that include green chemistry components. We set out to survey course instructors to get an idea of the green chemistry content that already exists within the current curriculum. This not only allows us to highlight the excellent green chemistry content but also helps us to identify areas where we could improve. With this initiative we also hope to be able to help undergraduate students who want to learn more about green chemistry to select courses that will educate them about green chemistry principles.